I have been working as a volunteer nurse in a mission with the Missioners of Christ and Light of the World Charities in Comayagua, Honduras for the past 5 months. What an amazing 5 months it has been! I volunteered at San Benito Jose; a hospital begun by the Franciscan Friars of the Renewal. The hospital is open 5 days a week, and serves only the poorest of the poor. It is a place where the poor and sick can come and receive physically and spiritually. It is beautiful to see the poor, who would normally be turned away, receive individualized and top-of-the-line care. The other component to my nursing work is the surgical brigades that are run every 6 weeks. In our hospital we have 4 state-of-the-art operating rooms that are used by teams of 20-30 US surgeons, anesthesiologists, and nurses every 6 weeks to perform approximately75 surgeries! I have had the opportunity to work the past several brigades as a PACU nurse. As nurses we are taught so much about being the patient advocate. This has taken on as new meaning for me here in Honduras! We are one of their only resources, and in some cases it is a life or death situation. To be able to work on their behalf is an honor. One day we were about to close and a young father came in with his 4 year old son. This man was 24 years old and had walked with his asthmatic son 7 hours from one of the surrounding mountain villages. He had arrived at 1pm, and proceeded to let every other woman and child go before him to be seen by the doctor. He was hoping that we still had time to see him before closing. I had to leave the room before I took the initial assessment because I could not stop the tears in my eyes. The love I saw in this father was humbling. He could see past his own suffering, and extended a hand to make sure the other women and children were also cared for. After we cared for his little boy with nebulizer treatments and antibiotics, he got back on his bike to start the 7 hour trip home. To be able to have a skill set as a healthcare professional that translates language and culture is truly a gift. 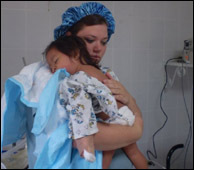 I hope to be able to always keep local and international missions as part of my role as a nurse! Thank-you to the Dr. Benjamin Josephson foundation for contributing to make this a possibility for me, you have helped more people then you can imagine!